If you choose to Learn Chinese in Shanghai, you’ll be learning the language in China’s largest city, a city full of history and culture. 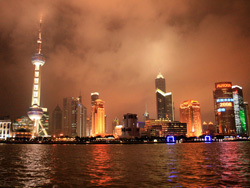 Shanghai is also a young and vibrant city, known for its cosmopolitan outlook and fast pace of life. The Shanghainese love to celebrate, so as a student in Shanghai, you might find yourself joining the dragon and lion dances at the Spring Festival, or sampling the local beer at the city’s Beer Festival in July! If you want to see the very latest trends and fashions during your Chinese course in Shanghai, look no further than Nanjing Lu, China’s number one shopping street. Alternatively, visit the famous riverside Bund area, for striking architecture and a bit of old-style Shanghai sophistication. Learn Chinese in Shanghai, a city where anything is possible! Our Chinese school is located in the old French Concession, right in the heart of downtown Shanghai and within easy walking distance of the famous Yongkang Lu Bar Street and Nanjing Road. The school’s premises are situated on a modern office block and are equipped with a student rest area and free WIFI access. Free tea and coffee are also available for students throughout the day. 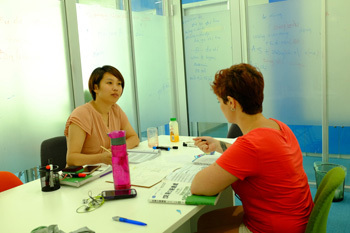 Our school in Shanghai offers Intensive Mandarin Chinese courses which include 20 language lessons each week. Class sizes are small with a maximum of just 6 students per group, so you will make quick progress with your studies. 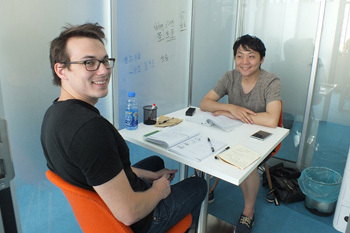 Private lessons are also available in Shanghai, for students who wish to focus on specific topics relevant for them, or who need a more flexible schedule. 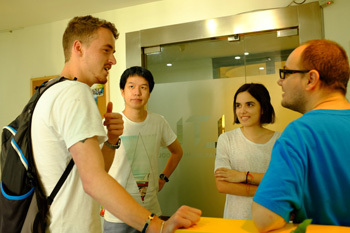 Our Chinese school in Shanghai offers accommodation with Chinese Host Families, or in shared apartments. For students who would like to immerse themselves in the Chinese language and culture then staying in a host family is the very best option. You will have a single room and be able to share the home, meals, conversation and daily activities with your host family, learning more and more Chinese as you practise! You host provides breakfast and the evening meal and you have access to the kitchen, laundry and bathroom, as well as Internet access. All water, electricity and gas bills are also included. If you choose to stay in a shared apartment during your Chinese course, you will have a private room and share the bathroom with fellow international students, or with local Chinese students. Whilst you are in Shanghai, you are sure to want to gain a better understanding of the culture, as well as the local area. 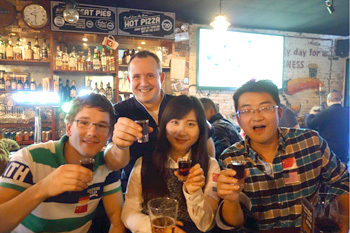 For this reason, our colleagues at the school regularly offer a varied programme of optional weekly activities, such as guided visits of local places of interest, as well as martial arts, culture and history lessons, giving you plenty of opportunity to socialise with other students studying at the school and explore Shanghai! As with all our schools, our colleagues will inform you of the exact activities offered on arrival, as well as any additional costs involved (usually for things like entrance fees and transport). New visitors to Shanghai may like to book the school’s ‘Shanghai Survival Kit’ which is the perfect support when you first arrive. This includes an airport transfer on arrival, a pre-charged Chinese 3G SIM card with 300MB of data and 200 minutes of free local calls during your first month, support registering with the police on arrival (required for all foreign visitors to China), access to a bicycle for your entire stay and a Shanghai public transport card, which can be used on the entire subway and bus system. Just ask us about prices for this package. 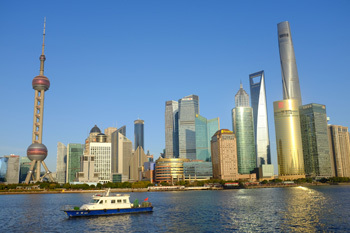 Shanghai has excellent transport connections, making it easy to arrive by train, boat or plane. Shanghai has two airports, Pudong International Airport and Hongqiao Domestic Airport. We can arrange an airport transfer for you, if required. Please contact us for details.